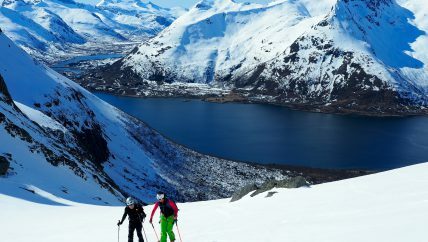 The Lofoten Islands offer all kind of ski terrain perfect for all ski levels; from gentle and regular hills at the end of the fjords to amazing steep couloirs... An incredible playground that offers unlimited possibilities! Every day we will discover new areas. The transfers are by car or mini bus from our Lodge. The closest areas are just 10 min from the house. The choice on where to go skiing usually is planned the previous day together with your guide depending on the group and the weather conditions. 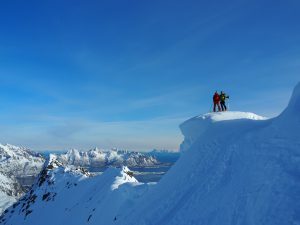 The vertical drop varies between 600 and 1000 meters, but it is always possible to return to put on the skins to make a second ascent on the same day. There are two different trip modalities; the Classic and Private programs.